Last Friday, punk funk band Metronomy played a free gig at the record store Rough Trade East, London. A friend had seen them play at the Amersham Arms and suggested this would be a good start to a Friday evening out on the town. I was quite excited because this trio is known for it’s lively performances that include choreographed dance moves, fist pumps, banging on chests, lights around the neck etc. Basically they have a sense of humour and put on a good show. 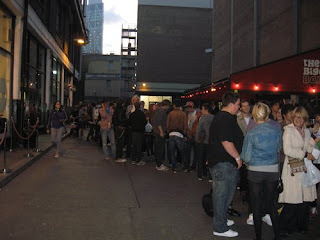 I walked, ran, trained, tubed and ran some more from West London all the way over to Brick Lane in the East only to find a huge queue, I guess this could only be expected since this band has picked up a pretty big live fan base. We queued and queued (something us Brits seem to like doing) and nothing moved. 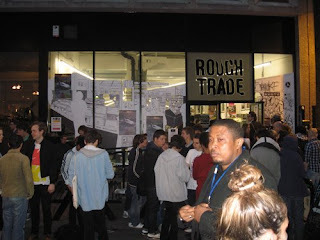 There were whispers that the band had put 350 people on their guest list and there were only 75 extra spaces for Rough Trade wristband holders. Well at this stage, I didn’t have a wrist band and my friend did. As a music blogger it pains me to say this but hunger and the need for a catch up with my friend overtook my reviewing duties and we skipped across the road to café 1001 for a drink instead. When we left an hour or so later, the queues had gone and from the comments on the bands MySpace site, I assume most people got in and had a good time. If you got in and want to leave any comments, would be great to hear how it went, any photos etc. 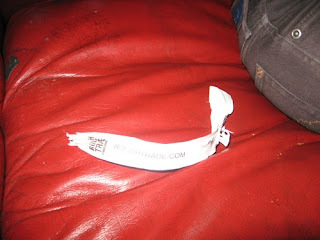 Off came the wristband at cafe 1001! To give you a flavour for Metronomy's sound, here's the video for 'You Could Easily Have Me' where a pig in a baby blue suit gets chased by a minotaur in a leotard! Remember that sense of humour I mentioned earlier? Their latest album is called Nights Out and is certainly worth a purchase and if you ever want to see them play live, don't go over the road for a drink!